Meeting Program. The 2004 SCEC Annual Meeting was held on September 19-22 at the Riviera Resort and Racquet Club in Palm Springs, California. The meeting was organized by the SCEC Planning Committee, chaired by Ralph Archuleta. There were poster presentations with abstracts due no later than September 3. In addition to the normal work of planning future activities (including the SCEC3 proposal), we again had several science talks during the meeting, with evenings set aside for poster sessions/viewing. The annual meeting formally started on Monday morning and concluded late Wednesday morning. Prior to the meeting there was a one-day 3D Rupture Dynamics Code Validation workshop, organized by Ruth Harris and Ralph Archuleta. Following the meeting there was a two-day workshop on Geological and Geomorphical Linkages between SCEC and EarthScope Science in Southern California, organized by Ramon Arrowsmith. The meeting itself featured presentations by David Applegate of the USGS and Margaret Leinen of NSF. There was also a town hall meeting for users of the SCEDC on Monday night. SCEC scientists were strongly encouraged to bring their students to Palm Springs. 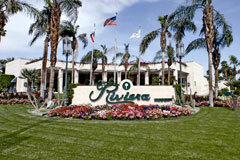 There was also a one-day teacher workshop held at the Riviera Resort and Racquet Club on Sunday, September 19. 15:30 Note: There will be a talk by Agnes Helmstetter - Is Earthquake Triggering Driven by Small Earthquakes?